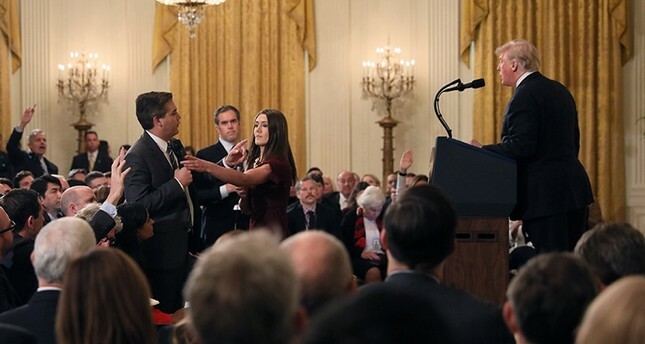 The White House has suspended the press pass of CNN correspondent Jim Acosta after he and U.S. President Donald Trump had a heated confrontation during a news conference. "It's a lie that anyone who has seen the video can see for themselves. We've crossed into a new territory -- not only is the White House going to lie but it's going to be obvious, and they expected people loyal to them to believe it." The White House News Photographers Association said it is "appalled to learn that the White House spokesperson may have shared a manipulated video." Manipulating images is "deceptive, dangerous and unethical," the organization said. Some Americans took to Twitter after the confrontation to express disgust over the incident, with one Twitter user pointing out the laughing faces of Sanders and White House adviser and son-in-law to the president Jared Kushner.